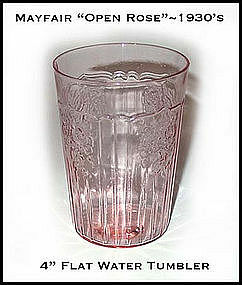 Pink Mayfair "Open Rose" 4 inch flat water tumbler in excellent condition. No damage, no repairs. The desirable pink color, not orange. 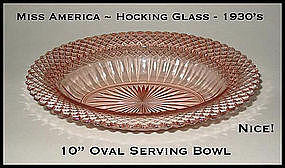 This true pink, Miss America bowl is in excellent condition. 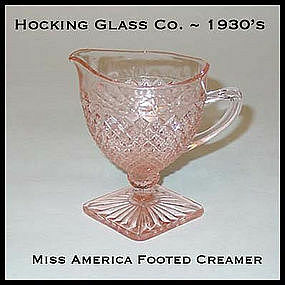 It was made by The Hocking Glass Co in the mid 1930's. 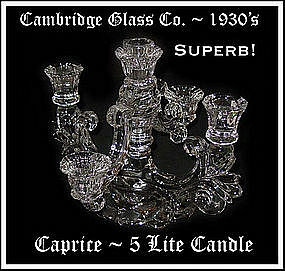 Superior quality 5 lite Caprice 2 pc cross arm candles made by The Cambridge Glass Co. in the 1930's. Excellent condition! May be used as either a 3 lite, or 5 lite candle holder. Very elegant! 1950's iridescent Iris and Herringbone footed creamer in excellent condition. 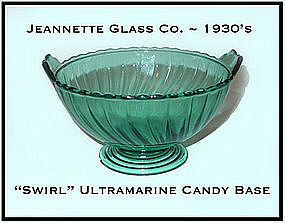 1930's Ultramarine Swirl footed candy base in excellent condition! This is the true blue ultramarine Swirl color, not the greenish one. 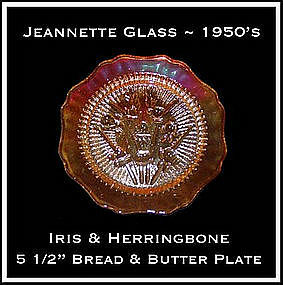 Carnival colored Iris & Herringbone iridescent 5 1/2" bread and butter, or sherbert plate in excellent condition. 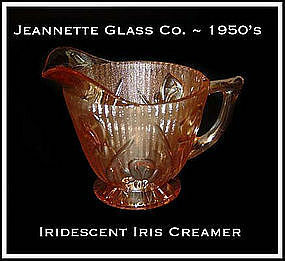 1950's offering by Jeannette Glass Co. Excellent condition with great color! 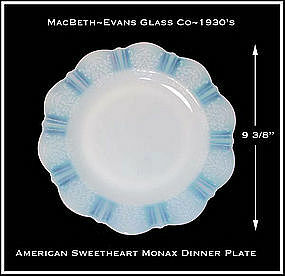 1930's American Sweetheart Monax 9 3/8" dinner plate in excellent condition. 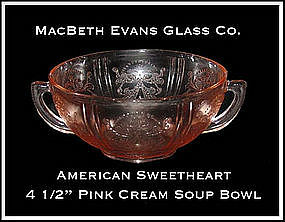 Pink American Sweetheart 9 1/2" Flat Soup Bowl in excellent condition with no damage. Pink American Sweetheart 2 handled cream soup bowl in excellent condition. 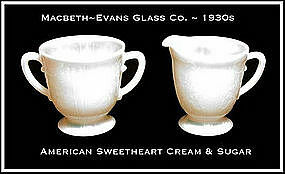 Made by The MacBeth Evans Glass Co in the 1930's. 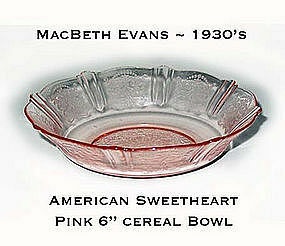 Pink American Sweetheart pink cereal bowl in excellent condition. 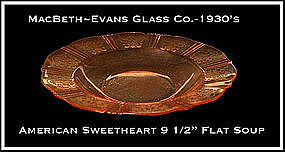 Made by The MacBeth Evans Glass Co in the 1930's. 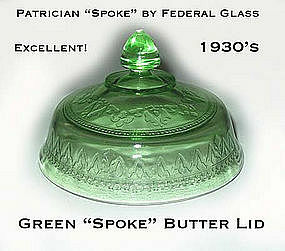 Patrician Spoke green butter lid made in the 1930's by Federal Glass. Excellent condition with no damage to report. Glass is bright and shiny! 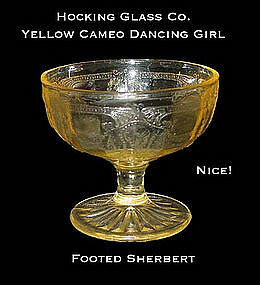 Yellow Cameo footed sherbert in excellent condition. 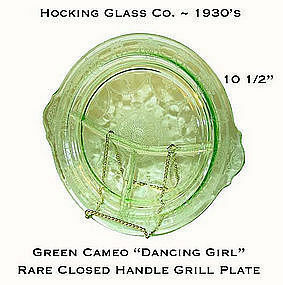 Green Cameo "Dancing Girl" hard to find closed handle grill plate in excellent condition with no damage. 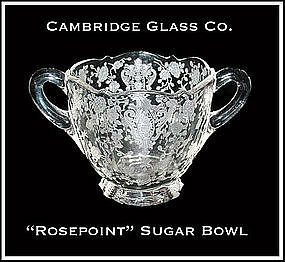 This was made by the Hocking Glass Co. in the 1930's. 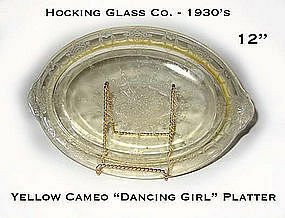 1930's yellow Cameo "Dancing Girl" 12" oval platter made by The Hocking Glass Co. Very light use marks. These platters are harder to find. 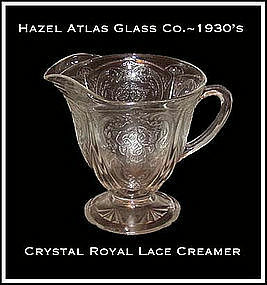 1930's crystal Royal Lace footed creamer in excellent condition.